With this week’s Kpreps Game Day, we’ll look at some of the “under-the-radar” matchups in each classification, and check in on several teams that ended long losing streaks in Week 1. Is there a changing of the guard in the Centennial League? Granted we are only one week into the season, but both Manhattan and Junction City dropped their openers for the first time since 2013. Meanwhile, Washburn Rural is coming off its best season in a long time. The Junior Blues finished 7-4 last season and reached the Class 6A state quarterfinals. After losing the regular season matchup to Manhattan 28-6 in Week 2, Rural rebounded to eliminate the Indians from the playoffs with a 24-21 win to advance to that quarterfinal round. It was Washburn Rural’s first victory over Manhattan since 1992; ending a 22-game losing streak against the Indians. Last week, Rural cruised to a 49-0 shutout of Topeka Highland Park in which the defense surrendered only 73 yards of total offense to the Scots. Manhattan dropped its opener to Shawnee Heights, 21-18, ending another long winning streak against a Centennial League rival. Heights last win against Manhattan came in 1985. Could Campus be this season’s Valley Center? The Colts seem to be building some momentum in Greg Slade’s fifth season in Haysville. Campus has posted records of 2-7 and 3-6 the past two seasons. That may seem like modest success, but it’s a step in the right direction for a program that won a total of ten games the eight previous years. The Colts need to look no farther than across the sidelines on Friday for inspiration. Valley Center came out of nowhere to finish 9-2 and reach the Class 5A state quarterfinals last season. Prior to 2016, the Hornets had won 20 total games in the previous 12 seasons. Both teams are coming off of wins last week. Valley Center grinded out a 12-7 decision over Salina South after losing senior quarterback Wyatt Lange to injury in the first half. Campus blasted Arkansas City 48-20 behind a stat-sheet filling performance by senior Federico Harvey. Harvey completed 14 of 17 passes for 303 yards and six touchdowns. He also rushed for 48 yards and a score and intercepted three passes on defense. These two programs seem to go through their share of peaks and valleys. Andover won five games each year from the 2004-07 seasons. The Trojans then posted consecutive 9-2 marks in 2008-09 before winning three total games in 2010-11. Things rebounded for Andover in 2013-15 as the Trojans went 8-3, 9-1, and 7-2, before falling to 1-8 in 2015. The Trojans finished 6-4 last season, losing in the round of 16. Similarly, Kapaun Mt. Carmel exited the playoffs in the first round for five consecutive seasons from 2006-10. In 2011, Kapaun reached the second round in finishing 8-3; a second straight 8-win season. The Crusaders fell to 3-6 in 2012 before reaching the state semifinals with a 10-2 campaign in 2013. Consecutive first-round exits in 2014 and 2015 was followed by a 2-7 season last year. Kapaun opened last Thursday with a 56-7 blowout of Wichita Southeast. Senior Nick Channel led the Crusaders with 139 yards rushing and three touchdowns. Channel also scored a special teams touchdown and picked off a pass on defense. Give Labette County credit, the Grizzlies stepped out of their league and scheduled one of the heavyweights of Class 4A. Last year it turned out to be more of a tune up for Andale, however, as the Indians built a 35-8 halftime lead and won 49-8 behind five touchdowns by senior Tristan Dagenais. Labette County did put up nearly 300 yards of total offense against the Indians, including 250 passing yards from Logan Dean. Dean’s cousin, Easton, has taken over at quarterback, and the 6-foot-7 junior opened with a six-touchdown performance in the Grizzlies 69-6 win over Fredonia last week. Labette County will have to match Andale’s physicality if the Grizzlies are to beat one of Class 4A’s top programs. This one could be over by 7:45. Two teams that rely heavily on the run game will square off in what is shaping up to be a key contest in the Pioneer League. Burlington surprised some people by beating Wellsville 40-20 in Week 1. Wellsville has been atop or near the top of the Pioneer League standings for the past several years, and have made significant runs in the 3A playoffs. Burlington beat the Eagles by rushing for 448 yards led by senior Connor Jeffers. Jeffers rushed 16 times for 229 yards and three scores, while sophomore Cael Johnson added 105 yards and two touchdowns. Santa Fe Trail grinded out 388 rushing yards in a 52-28 win over Osawatomie. The Chargers were led by junior Will Herren’s 25-carry, 294-yard night. Herren also rushed for five touchdowns in the game. Both Santa Fe Trail and Burlington showed some balance as the Chargers passed for 133 yards, while the Wildcats threw for 69. Last season, Hoisington, behind a huge performance from running back Hunter Hanzlick, defeated Wichita Collegiate, 31-22, in one of the season’s most anticipated regular season games. Hoisington spent most of the year ranked No. 1 in Class 3A before it fell in the sub-state championship game to Hesston. This year, Collegiate stands No. 1 in Class 4A, Division II, while Hoisington is not ranked in 3A. Hoisington opened with a 7-3 victory against Kingman. The Cardinals did not attempt a pass and finished with 43 rushes for 203 yards. Hoisington defeated Kingman, 44-3 last fall. Hoisington has won 27 straight regular season games dating back to a 21-20 double-overtime loss to Larned in 2014. That loss was Hoisington’s Zach Baird’s head coaching debut. Hoisington won its final eight regular season contests in ’14 followed by nine wins in ’15-16. If Hoisington is to continue its regular season streak, the Cardinals will have to stop Collegiate quarterback Cody McNerney. McNerney passed for more than 250 yards and four touchdowns in the Spartans 42-0 win over Rose Hill last week. In addition, McNerney rushed for 91 yards and a score and returned a fumble for a touchdown on defense. It’s early, but this one could go a long way in deciding the Tri-Valley League. The Chargers and Cubs each started off with big league wins in shutout fashion last week. Cherryvale opened with a 49-0 win at Erie, while Humboldt blasted Leon-Bluestem, 58-0. Cherryvale returns 13 total starters from last season’s 5-4 finish. The Chargers seemed poised for a second consecutive playoff appearance, but dropped three consecutive games to Caney Valley, Galena and Riverton before closing the season with a win over Southeast-Cherokee. Meanwhile, Humboldt finished 4-6 overall, but reached the 3A playoffs thanks to a more favorable district draw. The Cubs season ended with a 54-6 first-round loss at Wellsville. Humboldt returns nine starters on each side of the ball this season. The Cubs scored 30 points in the first quarter in beating Bluestem. The Cubs rushed for 411 yards in the win led by Jacob Barker’s 104-yard performance. Cherryvale defeated Humboldt in Week 2 last season, 24-13. Caney Valley and Eureka are the only other TVL teams to win their opener. Caney is always near the top of the league standings, while surprising Eureka blasted Chase County 52-18 in the opener. The Tornados had won just four total games in the past three seasons before Friday’s win. 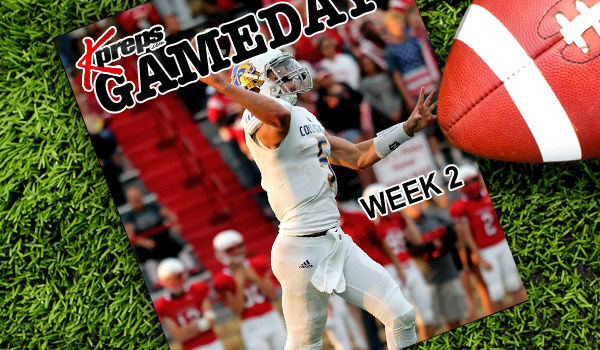 Thomas More Prep-Marian travels to Ellis in a Mid-Continent League matchup. It marks the only the fourth time the Ellis County schools play in football. The teams hadn’t played each other since 1953 before it returned four years ago. Ellis holds a 2-1 advantage but the road team has won each game. Ellis won 26-21 in ’14, while TMP took a 38-16 victory two years ago. Ellis won 42-32 last season. TMP quarterback David McFarland set a new Kansas single-game passing record in last Friday’s loss to Abilene, but Ellis senior Joseph Eck has been an explosive playmaker as well. A running back earlier in high school, Eck moved under center this fall. In an opening 18-12 victory against Syracuse, Eck rushed 21 times for 125 yards and two scores. He completed 4 of 9 passes for 24 yards and another TD. In the last two seasons, Eck, known for his speed, has 91 carries for 494 yards (5.4 yards a carry) and five rushing scores. Friday’s touchdown pass marked the first of his career. Coach Craig Amrein likes to use a run-heavy offense, and 85 percent of Ellis’ snaps were run last Friday. McFarland and TMP’s passing attack versus Eck and Ellis’ running game will likely play a pivotal role in the outcome. Kiowa County will visit Satanta in a matchup of two teams vying to be included in the upper echelon of the Southern Plains Iroquois Athletic Association standings. Satanta is beginning to build some consistency on the football field. The Indians suffered through a period of nine consecutive seasons from 2005-13 where they missed the playoffs. During that stretch, Satanta’s combined record was 17-64. In the last three seasons, the Indians are 18-11, including last week’s 54-6 win over Bucklin. Satanta junior Gabe Salas accounted for 33 touchdowns and 2,139 yards of offense in 2016. On Friday, the Indians used him exclusively in the backfield. He recorded 10 carries for 225 yards and four scores. Sophomore Houston Friend played quarterback and finished 4 of 7 passing for 29 yards. Now, Satanta gets three straight home games against Kiowa County, Ashland and Moscow. Kiowa County is now 35-33 since the consolidated school was formed in 2010. The Mavericks are looking to improve upon 2016’s 2-7 finish; their worst season thus far. Kiowa County opened with a 60-14 win at home against Minneola. Argonia-Attica and Caldwell are just outside the top-5 in Eight-Man, Division I and Division II, respectively. This is a litmus test for both teams. Caldwell went 7-2 last season, while A&A was 7-3. Caldwell won this contest last season, 90-48, and ended the Titans’ 21-game regular season winning streak. This will likely be a high-scoring game. From ’14-16, A&A was the top eight-man offense with a collective 54.8 points per game. The Titans, with Division II runner-up showings to Victoria in ’14-15, delivered 31 wins in those three seasons, fourth-most in the eight-man ranks. Caldwell ranked third in offense in all of eight-man at 56.2 points a contest in 2016. A&A had problems with turnovers but opened with a 38-20 victory against Central Burden. Caldwell defeated Udall, 50-20. Corbin Rice stepped in well at Caldwell quarterback after Colten Ward graduated. Caldwell had one turnover, averaged 6.1 yards per play and delivered 360 total yards. A&A had 405 total yards and 7.4 yards per play but finished with six turnovers. In last week’s Game Day feature, we listed some of the state’s longest winning and losing streaks. While Derby extended the state’s longest current winning streak to 24 games last Friday, six teams ended losing streaks that at least date back to the 2015 season. Most notably, Burrton snapped a 17-game losing streak with a 66-40 win over Fairfield. The Chargers’ victory was only the program’s second since 2011. Burrton had dropped 54 of its last 55 games entering this season. The Chargers reached the state semifinals in 2002 and 2003, but since have posted just a 15-103 record. Wetmore picked up its first win since resurrecting its football program for its first full season since 1987. The Cardinals had lost 13 straight since bringing football back, but defeated Valley Falls 60-18 in Week 1. We mentioned Eureka’s 52-18 win over Chase County above. That victory snapped a 12-game skid for the Tornados. Wellington ended an 11-game losing streak with a 34-6 win over Clearwater, and Medicine Lodge and Shawnee Mission South both ended nine game losing streaks. Here is a look at the list of current losing streaks updated for last week’s action.